Unsurprisingly, central London is home to a large number of the capital's Bib Gourmand restaurants. From Soho to Fitzrovia, the area is full of tempting but affordable eateries. Steamed milk buns filled with braised pork, fried chicken or lamb shoulder. After proving popular at Netil Market, BAO was given its first permanent home in Soho, serving its steamed milk buns and Taiwanese cuisine to more hungry Londoners. The buns are filled with ingredients such as braised pork, peanut powder and coriander; fried chicken, kimchi, Sichuan mayo and sesame; and lamb shoulder, garlic mayo and soy pickled chilli. For dessert, there's a fried Horlicks ice cream bao. Fancy more Bao? You can find them in Netil Market and Fitzrovia , too. The menu here reflects the countries along the Barbary Coast through to the Mediterranean Sea leading to Israel. What happens when you can't get a seat in one of London's most desirable restaurants? They open a new one, thankfully. 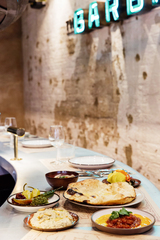 The second restaurant from siblings Layo and Zoe Paskin, Assaf Granit and Uri Navon who also own The Palomar, you'll find The Barbary in Neal's Yard, Covent Garden. The menu reflects the countries along the Barbary Coast through to the Mediterranean Sea leading to Israel. The mood of the food is 'grilling and baking from the Barbary Coast to Jerusalem' so you get Moroccan, Algerian, Tunisian, Libyan food like grilled duck hearts, sirloin steaks, octopus mashawsha, and asparagus with black tahini. Eat at the silver metal bar that wraps around the open kitchen and take in the theatre of the chefs at work. The slight snag - the place is tiny... and it doesn't take reservations. In short, be prepared to queue. As close to a Barcelona tapas bar as you can get. A large Parisian style brasserie in the heart of London. Chris Corbin and Jeremy King (the duo who brought us The Wolseley and more recently The Delaunay), return with a new addition to the London restaurant scene, Brasserie Zedel, which opened on 18th June 2012. Its location, set in the vast new development just off Piccadilly Circus (the restaurant occupies the Grill Room of the former Regent Palace Hotel), alone makes Brasserie Zedel a significant opening. But pair that with the Corbin and King names and you have a launch that's sure to get the critics salivating. We are promised "a large, bustling Parisian brasserie transported to the heart of London", with restored Art Deco style interiors by the designers of the moment, the David Collins Studio. Even more intriguing is the claim that the restaurant will offer "great value with remarkably low prices". If that really is the case, Brasseries Zedel will be busy. The restaurant offers all day dining and there's a separate 'Bar Americain' as well as a cabaret and live music venue called, quite brilliantly, 'The Crazy Coqs'. Vivek Singh's fourth restaurant takes inspiration from vibrant bazaars. Vivek Singh opened his fourth London restaurant in 2016, stepping into the world of bazaars. Following in the footsteps of Cinnamon Club, Cinnamon Kitchen and the less formal Cinnamon Soho, Cinnamon Bazaar takes inspiration from the colours, sounds, smells, bustle and energy of these marketplaces to create vibrant dishes like Indo-Chinese chicken wings; Calcutta spiced crab and beetroot in chickpea batter; double-cooked pork belly with curried yoghurt; and lamb roganjosh shepherd's pie. There's also set lunch and dinner menus, a tasting journey and high tea, which offers a selection of fine Jing Teas, Indian nibbles and sweet treats. A quality restaurant from the team behind the Michelin-starred Portland. From restaurateurs Will Lander and Daniel Morgenthau and chef Merlin Labron-Johnson - the people behind Michelin starred Portland Restaurant - is Clipstone, offering the same focus on quality cooking, wine and service but in a more informal setting. Also found in Fitzrovia, just two minutes away from Portland, on the corner of Clipstone Street, this sister restaurant offers an inviting list of cold cuts, larger sharing dishes and wood pigeon and homemade ravioli among the mains. The pizza oven (a relic from the old Italian restaurant which pre-dated Clipstone on this site) gives rise to freshly baked flatbreads and pizzas topped with unusual combinations like slow cooked goat, aubergine, yoghurt and mint. Wine, cocktails and house-made soft drinks get just as much attention as the food with half of the wine list - which includes Le Grappin's Fleurie and Fleurie-Poncie - available by the glass or carafe. This relaxed tapas bar gives Londoners an authentic taste of Spain. Providing Londoners with an authentic taste of Spain, Copita is an informal tapas bar that embraces the culture of eating either standing up or on stools at bar level, creating an upbeat and relaxed environment. Despite this, food is still very much at the forefront and the menu is constantly evolving, created using carefully sourced ingredients. Serving 'true tapas', they offer dishes such as truffled goat's cheese, almond and honey; duck egg with patat a lo pobre; sweet potato, bravas sauce, alioli and peanuts; and salt cod fritters with paprika mayo. Proving that sherry is a fantastic accompaniment to food, they have over 15 varieties to choose from and a good selection of Spanish wines, all available by the glass to ensure diners can enjoy a variety. This restaurant takes inspiration from the roadside shacks of Tamil Nadu and Sri Lanka. The third London-based Indian restaurant for the Sethi brothers - Karam, Jyotin and Sunaina Sethi, the siblings behind Michelin-starred Gymkhana and Trishna who also back Bubbledogs, Kitchen Table, Lyle's and Taiwanese steamed-bun specialists Bao - Hoppers takes inspiration from the roadside shacks of Tamil Nadu and Sri Lanka. The hopper - a thin, bowl shaped pancake made with fermented rice batter and coconut milk - and dosa are at the heart of the menu with the fermented ground rice and lentils batter served with a choice of meat, seafood or vegetable kari. The menu also lists 'rice and roast' dishes including a Buffalo shank biryani or Tamil spit chicken, and bar snacks, ('short eats' in Sri Lanka), including Oxtail Veechu Roti and mint sambol. A short list of cocktails focuses on Genever and Arrack, with Sri Lankan Lion lager and stout also available as well as ginger beer and buttermilk chaas made in-house. The design, by Katy Manolescue of Article Design Studio, references the hopper and dosa shacks of Sri Lanka and Tamil Nadu and the whole thing promises to be "fast paced and bold on flavour". Stripped backed Thai dishes made using quality British ingredients. Presented by self-taught chef Ben Chapman - known for the Smoking Goat - Kiln focuses on northern Thailand as well as Burma and Laos to create exciting street food style dishes. Opened in late 2016, the restaurant was highly praised by critics and visitors alike from the offset and has since gone on to win a Bib Gourmand in the 2018 Michelin Guide. The menu is stripped back but full of flavour with simple yet exciting dishes like an aged lamb and cumin skewer, wild mussel and sour turmeric curry, northern style pork laap, mackerel dry red curry, and langoustines with kaffir lime and sweet mint. Modern Indian food in a sophisticated setting. Chef Will Bowlby and front of house Rik Campbell, the team behind Kricket Brixton, have chosen Soho for their first permanent restaurant space. Influenced by regular trips to India, Kricket Soho specialises in modern Indian plates - this is simple and accessible Indian cooking. The menu has sections devoted to dishes made on a robata grill and breads, meats and fish baked to order in a clay tandoor. Choices include duck leg kathi roll, peanut chutney and pickled cucumber; lamb Haleem, fresh ginger, puffed wheat and fried onions; and venison rump, burnt onion raita , artichoke crisps and pickled blackberries. Dishes such as Bone marrow with cep kulcha are also sure to be a hit with late night diners. Enjoy Indian-inspired drinks - gin, black pepper, apricot and jasmine, through to short blends of Rose and cardamom with tequila, pomegranate and orange - at the cosy basement bar. This intimate restaurant serves food typical of modern day Jerusalem. The Palomar "serves lovely food" says Jay Rayner. "It pulls on the traditions of the Mediterranean fringes without being overwhelmed by them", and it does so with an "utterly infectious" "vigour and enthusiasm". This achingly hip, intimately small restaurant situated at the Leicester Square end of Rupert Street, in Soho, serves excellent food typical of modern day Jerusalem, with influences from Southern Spain and Italy, North Africa, through to the Levant. The narrow entrance space as you enter offers seating for 19 at the Kitchen Bar - from where you see the chefs at work - and opens out onto the main dining space at the back; a small room with space for 35 people arranged around banquette seating. The cooks occasionally break into an impromptu dance, or down shots with diners, creating a party atmosphere. But that doesn't affect the serious approach to the food - "dish after thrilling dish" (The Independent). From the sow-baked Yemeni bread to a salad of octopus, yogurt and chickpeas everything is to be sampled and savoured. As The Independent food critic Tracey Macleod put is, The Palomar is "Clamorous, cramped and exciting." A buzzy, rustic hideaway in central London. 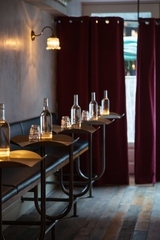 Awarded a Michelin Bib Gourmand, Picture restaurant is a buzzy, rustic hideaway on Great Portland Street. 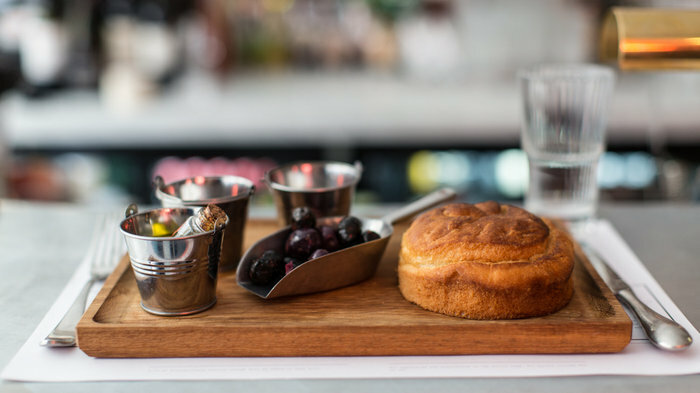 Guests can choose from a plethora of eclectic small plates, complemented by a selective list of wines, seasonal cocktails and beers. Led by an impassioned trio consisting of an Englishman, Irishman and Scotsman, the 3 bring together a wealth of experience running Michelin-starred restaurants in the West End, and a forward-thinking yet relaxed approach to cooking. The Venetian inspired tapas dishes keep Londoners coming back to this Russell Norman restaurant. A reincarnation of the original location above The French House, Polpetto is now housed within a larger site on Berwick Street - a welcome improvement that allows for groups bigger than four. Following the departure of head chef Florence Knight, who was a key part of the restaurant since the beginning, Polpetto reopened in August 2015 with a new menu. Returning to its original roots with Venetian influences, options include anchovy and chickpea crostini, spicy meatball pizzetta, rabbit pappardelle and zucchini fries. The wine list promotes northern Italian wines from small producers, while desserts include panna cotta with blackberries, flourless chocolate and hazelnut cake, and lemon polenta and almond cake. Sister restaurants co-owned by BBC's 'The Restaurant Man', Russell Norman, dubbed the "king of Soho restaurants" by The Times, include Polpo restaurants in Covent Garden, Soho and Smithfield as well as Mishkin's and Spuntino. 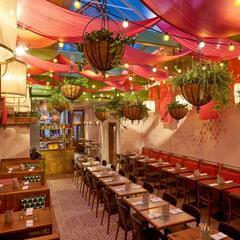 This split level restaurant has a relaxed tapas bar and more formal restaurant. Drawing heavily on the flavours of Spain and Italy, Salt Yard is a tapas bar that likes to mix up its influences. While upstairs is a charcuterie bar for lighter bites, downstairs is the more formal restaurant with tables tightly packed. There you'll be presented with the inventive tapas menu, divided into vegetable, meat and fish dishes. But most important is the particular emphasis they place on the quality of the ingredients. Cured hams and salamis include Jam'n Ib'rico de Bellota - made from semi-wild acorn-guzzling pigs from Southern Spain. Perfect prosciuttos from Alto Adige and herb flecked salamis from Tuscany come served on wooden boards. For vegetarians, the signature dish is courgette flowers stuffed with goats-cheese and drizzled with honey. With a sister restaurant Dehesa in Ganton Street and the Blackfoot Butchers opposite Salt Yard in Charlotte Place, owners Simon Mullins, Sanja Morris, and chef Benjamin Tish are taking tapas to new places. From cheap budget accommodation to luxury 5 star hotels see our deals for hotels, including Radisson Blu Edwardian Sussex Hotel from 63% off.